THQ and Ultimate Fighting Championship organisation has revealed the online feature set for UFC Undisputed 3. It features a lot of great gameplay mechanics which you can check out below. 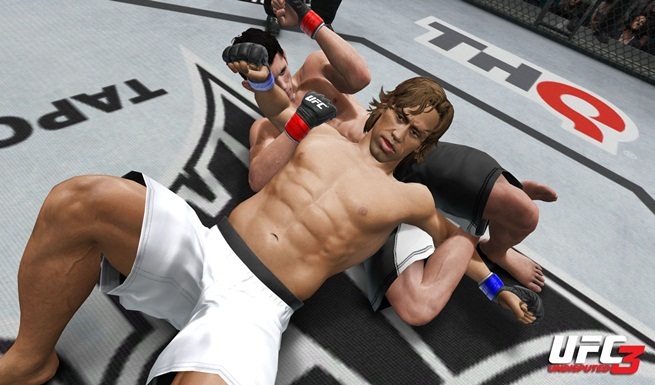 Online Exhibition – In Ranked Matches, players will select their fighters, referee and venue within UFC or PRIDE® Mode. In addition, they will have the option to generate a Quick Match for automated matchmaking, a Custom Match to search with specific settings or select Create Session to host a match. Once a fight is complete, players will proceed to the post-game statistics for rankings information. Ranked statistics will contribute to a player’s Fighting Points grade and rank, as well as Fight Camp leaderboards. Exhibition Matchmaking & Fighter Points – UFC Undisputed 3 will introduce new servers to significantly improve online matchmaking capabilities. Parameters will also be set on ranked matches to ensure fairness for leaderboard participants. The ranked settings are set to three rounds, while downloadable content and created fighters, mirror matches and camp fighting will be active during gameplay. In addition, Online Exhibition in UFC Undisputed 3 will introduce a new Fighter Points system. This system will enable players to compare ranks and show off their skill levels to see who is the ultimate champion. Content Creation and Community Sharing – A community hub will allow players to upload their custom content, including created fighters, highlight reels and logo designs, and share the items with others from around the world. Once uploaded, anyone can download the content and use it within gameplay. A ratings system will allow players to rank each piece of shared content for others to review. In addition, players will also be able to download and review upcoming fight cards. Fight Camps Return – Players may apply to join an existing camp or create their own, including selection of the camp’s name, developing a camp ID for use in match lobbies and creating a camp banner to be displayed during matches. The Camp Menu will offer several options based on player rankings, including access to the camp’s member list to monitor online status, option to view camp milestones and progress, as well as the ability to invite new camp members, accept applications and edit camp profile settings. In the gym, players will participate in free sparring with camp partners, play in unranked matches with camp members, compete in ranked matches outside of the camp and arrange chat sessions with up to four other players. The game will release on PS3 and Xbox 360 and is being published by THQ.